The 10 Best Sports Bars in North Dakota! There is something about watching the big game surrounded by friends and fellow fans that makes the whole experience more exciting. Add in a basket of chicken wings or a great burger and that experience is magnified tenfold. If you are tired of watching your favorite sports team alone, check out one of these great sports bars in North Dakota! If you are a North Dakota State Bison fan, there is no other sports bar quite like Herd and Horns. Owned and operated by former Bison athletes, the popular restaurant is located across the street from the campus, giving you a unique opportunity to take in the big game. With a menu that includes hand-made Philly rolls, chicken bacon ranch mac and cheese, and a grilled Cuban, you can easily get your eat on as you cheer for the Green and Gold. With a motto of “Enforcing the Rules of Good Times, Cold Beer, and Great Food,” it is easy to see why Wild Bill’s easily cracks the ton 10. The sports bar’s menu includes 23 homemade wing sauces and rubs, slow roasted barbeque ribs, and hand-breaded chicken fillets. While you eat, you can watch the big game on wall-to-wall plasma televisions. You won’t miss a single play. If you find yourself in Bismarck on game day, check out the Stadium Sports Bar. With a variety of unique beers on tap and a diverse menu that includes delicious appetizers and entrees, your visit will be well worth the time. Known for offering some of the best wings in town, Tailgaters is the perfect place to cheer your team on to victory. With 45 televisions, casino games, and great food, you will never need to frequent another restaurant. An outdoor patio makes takes summer visits to another level and a Monday through Friday lunch buffet will satisfy even the heartiest appetites. Known as one of the best pool halls in Minot, the Barley Pop Bar is also a great place to take in the big game. With a diverse menu and a variety of bar games available, the bar will keep you occupied long after the game is over. Check out their website for special events and pool/dart league information. The Old Broadway has been a local favorite for decades. With a newly renovated Sports Zone, it appears the restaurant will remain on the top of everyone’s list. The OB’s menu includes such sports-watching musts as cheese curds, wings (with 13 unique flavors), mini-corn dogs, and of course, burgers. Consistently voted the home of the best wings in town, Parrot’s Cay is the perfect place to take in the big game while getting your food on. The wing sauce heat ranges from five to 40 and you will truly achieve legendary status if you successfully tackle the 40. Other popular dishes include the Bayou Sampler (six crawdads, fried alligator bites, and grilled shrimp) and the Surf-n-Turf (wings and shrimp). With HD televisions everywhere you look, you won’t miss a basket or a touchdown at Sidelines. Daily food and drink specials can make your visit even better, as will the wide-ranging and delectable menu items. Check out their websites for a variety of dart and pool leagues as well. Finally, Sidelines offers a rentable decked out party room for your large get-togethers. Voted Minot’s “Best Sports Bar,” Sports on Tap is the perfect place to raise a beer to your favorite team while you watch them crush the opponent. Sports on Tap also realizes that nothing beats a good pizza or basket of wings while you watch, and their menu is sure to have something for everyone in your cheering section. The restaurant also sponsors a DJ or live music on the weekends, giving you another reason to stop by for a visit. 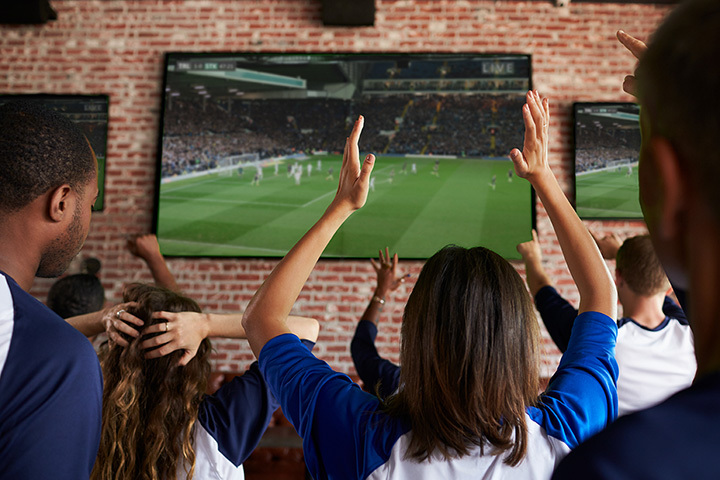 Whether you are interested in watch the game or simply want a unique place to hang out with your friends, Wonder Sports Bar is the place to be in Jamestown. With great food, cold beer, and plenty of viewing options, Wonder will ruin you for other sports bars forever.